This article is about the city. For the state, see Veracruz. For other uses, see Veracruz (disambiguation). Veracruz (Spanish pronunciation: [beɾaˈkɾus] ( listen)), officially known as Heroica Veracruz, is a major port city and municipality on the Gulf of Mexico in the Mexican state of Veracruz. The city is located along the coast in the central part of the state, 90 km (56 mi) southeast of the state capital Xalapa along Federal Highway 140. It is the state's most populous city, with a population that is greater than the municipality's population, as part of the city of Veracruz extends into the neighboring Boca del Río Municipality. At the 2010 census, the city had 554,830 inhabitants, 428,323 in Veracruz Municipality and 126,507 in Boca del Río Municipality. Developed during Spanish colonization, Veracruz has been Mexico’s oldest, largest, and historically most significant port. When the Spanish explorer Hernán Cortés arrived in Mexico on April 22, 1519, he founded a city here, which he named Villa Rica de la Vera Cruz, referring to the area’s gold and dedicated to the "True Cross", because he landed on the Christian holy day of Good Friday, the day of the Crucifixion. It was the first Spanish settlement on the mainland of the Americas to receive a coat-of-arms. During the colonial period, this city had the largest mercantile class and was at times wealthier than the capital of Mexico City. Its wealth attracted the raids of 17th-century pirates, against which fortifications such as Fort San Juan de Ulúa were built. In the 19th and early 20th centuries, Veracruz was invaded on different occasions by France and the United States; during the 1914 Tampico Affair, US troops occupied the city for seven months. For much of the 20th century, the production of petroleum was most important for the state's economy but, in the latter 20th century and into the 21st, the port has re-emerged as the main economic engine. It has become the principal port for most of Mexico’s imports and exports, especially for the automotive industry. Veracruz has a blend of cultures, mostly indigenous, ethnic Spanish and Afro-Cuban. The influence of these three is best seen in the food and music of the area, which has strong Hispanic, Caribbean and African influences. The name Veracruz (originally Vera Cruz), derives from the Latin Vera Crux (True Cross). Having established the settlement of Villa Rica (Rich Village) on Good Friday, April 22, 1519, Cortés dedicated the place to the True Cross as an offering. 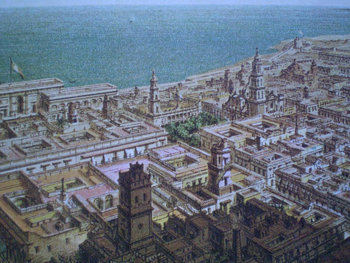 Drawing of the City of Veracruz and San Juan de Ulúa in 1615. It was called "City of Tables" because the houses were of wood with flat thatched roofs. Picture of Álbum del Ferrocaril Mexicano. Paintings: Casimiro Castro. Written by Antonio García Cubas. Published by Víctor Debray. 1877. Bilingual English-Spanish Edition. The Spanish captain Juan de Grijalva, along with Bernal Díaz del Castillo, first arrived in 1518 at the island later known as San Juan de Ulúa. The Spanish gave it that name because they landed on the Christian feast of John the Baptist (June 24), and in honor of the captain. De Ulúa is derived from the local name for the Aztecs, coluha or acolhua. According to tradition, when the Spanish arrived, they found two young men who had been sacrificed. When they asked the locals what had happened, they said the Aztecs had ordered the sacrifice. The word for Aztec evolved into Ulúa. Because the first expedition detected the presence of gold in the region, a second expedition under the command of Hernán Cortés arrived in 1519. Cortés and his men landed at the shore opposite the island where Grijalva had moored, which has the pre-Hispanic name of Chalchihuecan. Cortés, Francisco de Montejo and Alonso Hernández Puertocarrero founded the settlement, naming it Villa Rica de la Vera Cruz. :102 The name Villa Rica (rich village) referred to the gold that was found here and Vera cruz (True Cross) was added because the Cortés expedition landed on Good Friday, a Christian holy day. When Cortés and his soldiers abolished the Aztec despotism and elected a Justicia Mayor and a Capitán General, they created the first city council on the American continent. The city was the first on mainland America to receive a European coat of arms, which was authorized by Carlos V in Valladolid, Spain on 4 July 1523. The original settlement was moved to what is now known as Antigua, at the mouth of the Huitzilapan (or Antigua River) shortly thereafter. This separated the city from the port, as ships could not enter the shallow river. Ships continued to dock at San Juan de Ulúa, with small boats being used to ferry goods on and off the ships. When large-scale smuggling of goods took place to avoid customs officials, the Spanish Crown ordered the settlement returned to its original site to cut down on that traffic. Docks and an observation tower were constructed on the island to ensure that goods went through customs officials. As in other parts of Mexico, the indigenous peoples suffered from epidemics of European infectious diseases, which decimated the population after contact. The Spanish began to import African slaves via the port of Veracruz to work on sugarcane plantations. In the 16th century, this state had more slaves than any other in Mexico. Before the slave trade was abolished, Mexico had the second-highest population of African slaves in the Americas, following Brazil. By the end of the 16th century, the Spanish had constructed roads to link Veracruz with other cities such as Córdoba, Orizaba, Puebla, Xalapa and Perote. Their gold and silver were the principal exports. This caused the city problems with pirates, prompting the construction of Fort San Juan de Ulúa on the island where Grijalva had landed in the mid-16th century. Major public buildings were constructed at the beginning of the 17th century: the municipal palace, the monastery of Nuestra Señora de la Merced, and the Hospital de Nuestra Señora de Loreto. In 1618, a fire nearly reduced much of the city to ashes. In 1640, the Barlovento Armada was stationed here for additional defense against pirates. Through the rest of the colonial period, this was the most important port in New Spain, with a large wealthy merchant class that was more prosperous than that of Mexico City. The pirates Van Hoorn, Laurens de Graaf and Michel de Grammont attacked Vera Cruz in 1683. The 19th century was marked by armed conflicts. During the Mexican War of Independence, Spain placed troops here to maintain Mexico City’s sea link with Spain. In 1816, Antonio López de Santa Anna commanded royalist troops countering the insurgency. In 1820, insurgents took the city, despite Santa Anna’s attempts to stop them. The last viceroy of New Spain, Juan O'Donojú, arrived here in 1821, where he signed the Treaty of Córdoba with Agustín de Iturbide at Fort San Juan de Ulúa. In 1823, Spanish troops remaining at Fort San Juan de Ulúa fired on the newly independent Mexican city of Veracruz. The city’s defense against the attack earned its first title of “Heroic City.” During the Pastry War in 1837, the city mounted a defense against a French attack, and earned its second title of "Heroic City." Ten years later, civil war between liberals and conservatives forced Benito Juárez’s government to flee the capital of Mexico City. Juárez went to Veracruz and governed from there in 1857. In 1861 Spain sent its troops to occupy the port in an effort to secure payment of debts, which Juárez had suspended. French military forces accompanied them to prepare for Maximiliano I and occupied the city when the emperor and his wife Carlota of Belgium arrived in 1864. The conflicts and damaged trade relations with Europe took its toll on the port of Veracruz. By 1902, the port facilities had deteriorated, and it was considered one of the most dangerous on the American coast. President Porfirio Díaz contracted with foreign enterprises to modernize the port’s infrastructure. Between April - November 1914, during the Mexican Revolution (1910-1920), the US attacked and occupied the port in an effort to try to preserve trade in the dispute with President Huerta. The city gained its fourth title of "Heroic City". After the Revolution, most port workers became unionized. Through most of the 20th century, federal and state legal and political initiatives intended to better workers’ lives had effects on the operations of the port. Eventually, unions came to have great power over the operations and tariffs charged. By the latter part of the 20th century, competing unions made the operations of the port difficult. Some blocked access to the port from federal roads and financial corruption was a problem. In the 1970s, a federal commission was established to design a new administrative system for the ports of Mexico. The legislature passed laws authorizing the federal government to take control over important ports such as Veracruz. The federal government modernized the port, adopting automation of loading and unloading. This resulted in a reduction of 80% of the port's jobs and labor resistance through strikes. The dockworkers' unions unified, negotiating for members to have a stake in a new company to manage the port's functions, named the Empresa de Servicios Portuarios de Veracruz, S.A. de C.V. The old Compañia Terminal de Veracruz was dissolved in 1988 and the new organization was fully in place by 1991. In September 2010, Hurricane Karl, a small, strong Category 3 hurricane, caused widespread flooding and damage affecting approximately half a million people. Sixteen were confirmed dead with another eleven missing. Sixty-five municipalities in the state were declared disaster areas. Preliminary damage estimates total up to $3.9 billion USD and $50 billion MXN. Much of the most recent commercial development has been in newer areas in the south of the city and in the neighboring municipality of Boca del Río, linked by a ten-kilometer road along the shore that caters to tourists and business travelers. The hotels in Veracruz are more rustic and traditional; the modern ones are in Boca del Río, especially near Playa Mocambo. Veracruz is not as popular a tourist destination as many other resort areas. But the city has been promoting an identity as a tourist destination, emphasizing new attractions such as the Veracruz Aquarium and the City Museum, and the renovation of historic ones, such as Fort San Juan de Ulúa and the Naval Academy. The cultural center of the city is its main plaza, officially named Plaza de las Armas but commonly called the Zocalo. This tree-shaded square, in which have camped a number of foreign invading armies, is occupied from morning to night with people playing dominos, selling food, cigars, etc. playing music, dancing and other activities. It is more crowded in the evening, when nearly every night the danzón is danced. This dance was brought over to Mexico from Cuba by refugees in the 1870s. It was originally restricted to the lower classes but eventually gained accepted by all levels of society. The danzón is sponsored by several dance schools dedicated to keeping the tradition alive. Around the plaza are numerous shops and restaurants, as well as the municipal palace and the cathedral. The Municipal Palace was built for the city council in 1608. The building was extensively remodeled in the 18th century. Its architectural style is a sober Baroque with a tower at one of the corners. Lookouts used this tower to keep watch on the ships entering and leaving the port. It has a large courtyard surrounded by wide arches and is the oldest city government building in Mexico. The Cathedral of Veracruz, named Catedral de la Virgen de la Asunción, is also located on the Zocalo. This cathedral was begun in the 17th century and finished in 1731. It was modified in the 19th century but was not designated as a cathedral until 1963. The building has five naves, with an octagonal cupola covered in Puebla tiles. The tower was begun in the early 20th century and has its own small cupola. The main façade is Neoclassic with two levels and a crest. The lower level contains an arched entrance flanked by two Doric columns and the upper level contains the choral window, above which is a medallion. The interior is simple with crystal candelabras. The Carranza Lighthouse overlooks Veracruz's malecón. In the port area are the Pemex Tower, the old lighthouse, which was the seat of government for Venustiano Carranza, and the Crafts Market. On Marina Mercante Street are located the Old Customs Building, the Postal and Telegraph twin buildings, as well as the old railroad terminal. In the 1920s, passenger traffic was such that the station had its own hotel. The Juarez Hemicycle Monument stands in front of the Civil Registry Building, which contains the first birth certificate issued in the country. The malecón (boardwalk) stretches for kilometers along the Gulf of Mexico, leading from the city center into the suburbs. This area is popular at night, when people stroll and exercise, enjoying the ocean breezes. Near the city center, the malecón is crowded with merchants selling knick-knacks, souvenirs, jewelry made with seashells, and T-shirts. Fort San Juan de Ulúa is located on an island, now connected to land of the same name. The island is part of the La Gallega coral reef and has about 2,500 meters of beach. The full reef covers about 100 hectares and varies in depth between sixty and ninety centimeters, forming a natural break. In the pre-Hispanic era, this island was a sanctuary dedicated to the god Tezcatlipoca. The site where the Spanish first landed has been developed over the centuries and today serves as the container ship terminal of the port. Most of the island is occupied by the fort. This fort was built where the Spanish first landed to conquer Mexico. They used it for their last defense during and just after the Mexican War of Independence. Between these periods, the fort helped defend the city against piracy and later was used for prisoners and interrogations of the Mexican Inquisition. The fort was begun here in 1582 to protect the city from pirates and was enlarged in 1635 during the period of frequent pirate raids. It was finished in 1707. After the War of Independence ended in 1821, the Spanish kept control of the island and fort, and occasionally bombarded Mexican forces on land. They finally transferred this area to Mexico in 1825. The fort was used in 1838 during the Pastry War with the French. In 1847, it was used for an unsuccessful defense of the port when United States (U.S.) forces invaded during the Mexican–American War. In the 19th century, the fort was converted into a military prison. The fort’s narrow stone passageways lead to a series of dungeons with walls 24-feet thick in some places. Those cells which were darker and hotter were reserved for those charged with more serious crimes. A few of the most dreaded dungeons were nicknamed "Heaven", "Purgatory" and "Hell". Some of prison’s more famous prisoners include Fray Servando Teresa de Mier and Benito Juárez, both political prisoners. But the most famous is Jesús Arriaga, better known as "Chucho el Roto". Most people visit San Juan de Ulúa out of attraction to the legend of this 19th-century bandit. Jesús Arriaga, better known as Chucho el Roto, was held at Fort San Juan de Ulúa where he died. It is not known whether he died of natural causes, as a result of a fight with other prisoners or by other means. Chucho was a Robin Hood figure who lived during the 19th century. He stole from the rich and gave to the poor, inspiring songs and poetry such as the verses penned by Rafeal de Zayas Enriquez. Chucho was arrested in Querétaro after a jewelry store heist. He was sent to the Belen Prison in Mexico City, then to Veracruz. He was also renowned as a seducer of women, especially those who were rich and lonely. Most of his targets were jewelry shops, pawnshops and the homes of the wealthy. Along with Fort San Juan de Ulúa, the city used to be walled in for protection against pirates and invasions. All that is left of these city walls is the Baluarte, a small fortress. The 1635 structure has thick, sturdy walls with cannons directed to cover sea approaches. Inside is a small museum featuring a collection of high-quality pre-Hispanic jewelry discovered in the 1970s by a fisherman. The Veracruz Aquarium  was built in 1992 and is the largest and most important in Latin America. The Freshwater Gallery consists of thirteen exhibitions containing 562,177 liters of water. These exhibitions contain aquatic species from Asia, Africa, South America as well as Mexico. The Reef Tank is best known for its sharks. The Salt Water Gallery contains fourteen tanks with tanks dedicated to the species of Veracruz, the Red Sea and the Pacific Ocean. Another exhibit is devoted to sharks, containing 25 species that swim around visitors as they walk through a glass tunnel built through the tank. There is also an exhibit dedicated entirely to manatees. The Heroica Escuela Naval (Heroic Naval School) was founded here in 1897 by José María de Vega, then Secretary of the Navy. The school was founded because at the time, Mexico was dependent on the hiring of foreign sailors and foreign training of its officers to staff its Navy; prior attempts to establish an academy had failed. Porfirio Díaz approved the institute to train both Navy and Merchant Marine officers, to be based on similar schools in Western Europe. The City Museum (Museo de la Ciudad) is located at the intersections of Zaragoza and Esteban Morales streets in the historic center. It is housed in a two-story building which is of neoclassic design built between the mid and latter 19th century. The main façade on Zaragoza Street has an enormous main door with posts, framed by Ionic pilasters, which reach to the upper floor, and topped by a pediment and a cornice. The building was originally constructed as an asylum. When the French invaded Veracruz in 1861, the building was commandeered for other purposes until 1870. The asylum took it back and operated here for almost 100 years. New facilities were constructed for it south of the city, and the building was renovated for adaptive reuse as a museum. The City Museum was inaugurated in 1970 and contains exhibits relating to the history of Veracruz. The Agustín Lara House Museum exhibits works, photographs and personal effects of the poet Agustín Lara, located in what was his house in Boca del Río just outside Veracruz city. News clips, caricatures and a replica of the radio studio where he hosted "La Hora Azul" ("The Blue Hour") are among the items on display. Lara was one of the city's most famous sons as a popular songwriter and singer in Mexico. He began his career playing the piano in brothels and later became a bullfighter. Lara had seven wives, one of whom was Mexican screen diva María "La Doña" Félix, for whom he wrote the song, "María Bonita". To be a gentleman, when he and Félix were about to break up, he married her to "make an honest woman of her" even though they had lived together for years. Veracruz is primarily a commercial port, but it has some beaches and other sea attractions. Controversy has accompanied the clean-up of the island called Isla de Sacrificios, which lies just off the coast of the city and measures 450 meters long and 198 meters wide. The island is part of a system of twenty-three coral reefs called the Veracruz Reef System, which is protected as a national park. Visitors can kayak to the Isla de Sacrificios to observe seagulls, pelicans and the fish that inhabit the coral reef. In 1983, a study and initial cleanup project was undertaken at the island, which collected fifty tons of trash. Shortly thereafter, the island was closed to the public and since then, there has been a struggle among authorities, tour operators and fisherman as to the fate and uses of the island. There are those who would like to build hotels, restaurants and other facilities for ecotourism. However, access to the island has been restricted to research, teaching and the occasional sporting event. Other small islands and shoals off the coast include: Isla de Enmedio, Isla Verde, Anegada de Adentro, Santiaguillo and Anegada de Afuera, the last two next to Anton Lizardo beach. All of them are included within the Sistema Arrecifal Veracruzano national park and make fine sites for SCUBA diving. Several operators in Veracruz and in Boca del Rio offer scuba equipment and tours. The best season for scuba diving is May to August. For 400 years, the island has suffered ecologically from pollution related to development, as well as the pillaging of its coral reefs and archeological pieces. [clarification needed] Current pollution problems are mostly due to untreated wastewater that flows into the ocean from the city and the polluted Jamapa River. Its coastline has been modified and more than 200 hectares of reefs in its littoral zone have been pillaged. Coral and other marine species have been taken for commercial and craft purposes, as well as by fishermen. Some of these coral reefs have already died due to pollution. Since the island was closed, there has been some revival of marine life. Ruins here have not been extensively studied but cover more than 700 years of history. In the pre-Hispanic era, the island was considered sacred and a sanctuary on which to perform religious rites. Human sacrifice was frequently performed and the remains buried here. A small altar is referred to in historic sources but it had not been found. The Spanish built a hospital here, but all that remains is part of one wall. Later, a storage faculty to store gunpowder was built, as well as an obelisk during the French Intervention, but these have crumbled as well. The only surviving structure is a small lighthouse. About 800 archeological artifacts have been partially excavated on the island but cannot be exhibited because the humidity and weather would damage them. Reopening the island is difficult because the ecosystem here is delicate, and any construction could damage archeological sites and valuable pieces. Any plans to reopen the island to visitors will require the collaboration of the Veracruz Reef System Park, to which it belongs, as well as Secretariat of the Navy, INAH, the Veracruz Aquarium and other government agencies negotiating with the local associations of hotels, tour operators and fishermen. So far, government agencies have blocked efforts to develop anything on the island. An ecotourism project consisting of guided tours is considered the most viable, such as that proposed by the Veracruzana University and the Aquarium, but there is concern on the part of INAH and the Secretariat of the Navy. The mainland has several beaches. Playa Martí is located between the city of Veracruz and Boca del Río, five km from the historic center. This beach also has goals and nets for football and volleyball games. The Playa de Hornos is located next to the Veracruz Aquarium. It is safe to swim here. Amenities include tables, chairs and umbrellas to rent, as well as food stands. During the high seasons lifeguards are on duty. Banana boats may be rented. There are also boats that take tourist to the Isla Canuncito. Villa del Mar is just south of Playa de Hornos and is more popular. Because of its importance as Mexico's principal Caribbean and Atlantic sea port, Veracruz has always been a locus for the mixture of different cultures, particularly native Mexican, Spanish and African. During the colonial period, African slaves were imported to work in the fields and shipyards. Since Mexico's independence from Spain in 1821, immigrants from Italy and Cuba have settled in the city. Sugar and rum production have been mainstays as commodities; during colonial times they were produced by slave labor and later, immigrants often entered labor and industrial jobs. Together these ethnic groups have created rich cultures. The Naval Academy of Mexico attracts both Mexican and international sailors and officers, adding to the cosmopolitan mix of the city. The city has a reputation for being lively, with many people out in the squares listening to music late into the night. In the morning, they frequent sidewalk cafes for their morning coffee. Veracruz recipes use corn, beans and squash as staples, a practice dating to the indigenous peoples. Local diets also include indigenous tropical foods such as chili peppers, tomatoes, avocados, pineapples, papaya, mamey, sweet potatoes, peanuts and sapote fruit, all of which have been cultivated since pre-Columbian times. The Spanish introduced the use of herbs such as parsley, thyme, marjoram, bay laurel and cilantro, as well as saffron, wheat, rice, almonds, olives/olive oil, garlic and capers. Because of the lengthy colonial period and international port, these ingredients are used more widely here than in other parts of the country. A signature dish of the area, Huachinango a la Veracruzana (red snapper Veracruz-style), uses local fruits and vegetables (tomatoes, chili peppers) and Spanish ingredients (olive oil, garlic and capers). Other popular dishes include arroz a la tumbada, a rice dish baked with a variety of seafood and caldo de mariscos, a seafood soup reputed to cure hangovers. "El Gran Café de la Parroquia" is the most famous coffeehouse in Veracruz. Its signature drink, the "lechero", consists of espresso coffee mixed with steamed milk. Coffeehouses are a center of social life in the city, and the Gran Café del Portal and the Café de la Parroquia are the two best-known establishments. To request a refill, customers clink the sides of their glasses (not cups) with their spoons. This clinking can be heard from the early morning to late at night. The story behind this custom is that a trolley driver used to ring his bell when he was a block away from the Gran Café del Portal to let the waiters know he was coming. When the driver died, his casket was borne on the trolley and when it passed the establishment, the customers and waiters tapped their glasses in his honor. The song "La Bamba," made famous by Ritchie Valens, has its roots in the Veracruz "son" style of music, which originated in southern Veracruz state. It has African and Caribbean influence and is popular throughout Mexico, Latin America and the United States. Traditional Veracruzian music is called "Son Jarocho". Although there are many types of son music found in Mexico, the Son Jarocho is typically associated with the city of Veracruz. Other types of son include "Son Comercial". This style is faster and flashier than the traditional Son Jarocho and can be heard in Mexican folkdance exhibitions, when Veracruz women with long white dresses and fans dance with partners also dressed in white. The Son Comercial developed in the 1940s from the Son Jarocho; in the 21st century it is so pervasive that many mistakenly believe it to be the first version. The Casa de Cultura has a workshops for traditional music and son singers can be heard just about anytime on the main plaza (Zocalo) The Veracruz Carnaval has been celebrated every year since 1866, during the empire of Maximilian I of Mexico. At that time, a request was made to sponsor "Festival of Masks," which would consist of dances at the principal social gathering sites of the city such as the main theater. While the events were officially held at these locations, many residents took advantage of the celebration on the streets near these sites. Eventually, the event became based in the historic center of the city and focused on the Carnaval Parade of Veracruz. Today, the event begins with the "Burning of Bad Humor" and ends wIth the "Burial of Juan Carnaval". Carnaval here is the largest celebration in the country. Veracruz has become a popular location for filming. The government has supported the development of filmmaking in the municipality. Laguna Verde Nuclear Power Plant (LVNPP) in nearby Alto Lucero, Veracruz, produces about 4.5% of Mexico's electrical energy. General Heriberto Jara International Airport serves the city with daily service to Mexico City as well as international service to Houston only. The commercial passenger airlines to currently serve VER airport are Aeromexico, Interjet, United Airlines, Aeromar Vivaaerobus and Mayair. Non-passenger rail transport (Kansas City Southern de México, formerly Transportación Ferroviaria Mexicana) connects Veracruz with Mexico City and state capital of Xalapa. 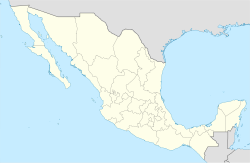 Veracruz is linked to Mexico City by a four-lane toll highway which also passes through Cordoba and Puebla. Halfway between Veracruz and Cordoba, it is connected to the La Tinaja-Cosoleacaque toll highway which goes as far as Villahermosa, Tabasco. Another toll highway goes to Xalapa. Urban transport formerly was presented by Veracruz tram in 1908 – 1981. Now the city has buses, including trolley-replica tour buses that looks like former trams and highlighted at evening. The Universidad Veracruzana was established in 1944. It was created by joining a number of professional and higher education establishments together. It is now the main center of higher education in the state of Veracruz, with five campuses and twenty-two satellite locations in the state. The student population is approximately 70,000, offering degrees in sixty different fields. Veracruz Institute of Technology was founded in 1946 by Ismael Lagunes Lastra. It started out as the School of Arts and Letters, with a mission to train students for the jobs associated with the developing port and industrial base of the city. It started teaching students at the secondary and high school level, later adding bachelor's degree programs. In 1952, the school received a grant of lands by the federal and state governments to expand. Technical programs were added in the 1960s and have become the main part of the school’s work, Veracruz Institute of Technology is famous due to its bachelor of engineering in biochemical engineering, masters and PhD about food science and biochemical engineering. Private universities include Cristóbal Colón University, mainly dedicated to architecture and administration . UNIMEX was founded in 1991 and focuses on marketing, graphic design and law. The Port of Veracruz is the oldest and largest port in Mexico, deeply important to its history. During the colonial period, it was the most important port in New Spain, the connection to ports and the Atlantic trade creating a large wealthy merchant class, which was more prosperous than that of Mexico City. From the port of Veracruz were exported turkeys, corn, beans, avocados, and cotton to Spain. From Spain came fava beans, wheat, rice, cattle, pigs, fabric, wine and other goods. In the mid 16th century, so much gold and silver was found in Veracruz that these precious metals were the chief export to Spain on what were called treasure ships. The bounty attracted pirates, mostly from Britain and Holland, such as Francis Drake and John Hawkins, who preyed on such ships. Veracruz was invaded during conflicts with France and the United States. 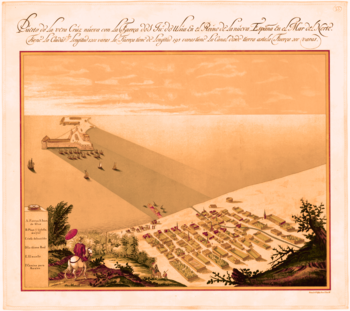 In the latter half of the 19th century, Veracruz's importance waned as trade to Europe diminished. The port was refurbished at the beginning of the 20th century, but petroleum production was the primary income for the state rather than the port. This began to change in the latter half of the 20th century, and the port has surged back to the state's economic forefront. In 1991, the federal government took over the port of Veracruz to correct[how?] the handling of merchandise. Later that same year, the first private shipping companies began operations. In 1993, the Law of Ports was passed regularizing the operations of ports in the country. This law created the Administración Portuaria de Veracruz (Port Authority of Veracruz). In the 2000s, the port continues to handle all kinds of cargo, moving 16.1 million tons[verification needed] of products in 2004. This figure is expected to rise once modernization efforts have finished, especially a truck bypass that leads directly from the highway to the port. Veracruz is the gateway for Mexico's automobile industry, which is concentrated in the center of the country, in the states around Mexico City. This port has several advantages. It is the first to be equipped specifically for shipping automobiles. Located on the south-central coast, Veracruz is closer to car manufacturers and has better access to both import and export markets in the U.S., Europe, Central and South America than other Mexican ports. In 2004, the port handled 70% of the automobiles exported. With traffic expected to rise, the port authorities unveiled a program to enlarge the port's infrastructure and expand operations by 2010. However conversion of port area for tourism challenges operations. The port handles 7-800,000 vehicles per year; the largest amount on the continent. As the municipal seat, the city of Veracruz is the governing authority for 128 other named localities during the 2010 census, forming a municipality with a territory of 241 km2 (93 sq mi). The population of the municipality is 552,156 inhabitants, of whom 428,323 or approximately 77.6% live in municipality's portion of the city proper. The municipality is bordered by the municipalities of La Antigua, Boca del Río, Manlio Fabio Altamirano, Medellín, and Paso de Ovejas, with the Gulf of Mexico to the northeast, and has an average altitude of ten meters above seal level. The area is flat with little in the way of elevations and is crossed by the Medio, Grande and Tonayán Rivers. There are also beaches here such as the Sacrificios and Verde. Its climate is tropical with an average temperature of 25.3 °C (77.5 °F). Vegetation is mostly of the rainforest type, with many trees losing leaves during the winter dry season. Fauna mostly consists of birds, small mammals and insects. Much of the land in the municipality outside of the city is used for agriculture and livestock. Principal crops include corn, beans, watermelon, oranges, sorghum, mango, pineapple and sugar cane. Livestock raised includes cattle, pigs, sheep, fowl and horses. There is also some forestry. The municipality contains deposits of marble, lime, cement, sand and clay. In and around the city there are a number of industrial sites producing paints and solvents, food products, plastics, petrochemicals and metals. Like the majority of the coastal part of Veracruz State and southern parts of Tamaulipas, the city of Veracruz has a tropical savanna climate (Koppen: Aw). The wet season typically lasts from June to October, when a vast majority of the yearly precipitation falls. Large tropical thunderstorms occur nearly daily in the late afternoon, originating in the moist atmosphere above the Gulf of Mexico. The wet season has slightly hotter temperatures and is more humid than other seasons; the dewpoint can easily exceed 25 °C (77.0 °F). It has fewer foggy days than the dry season (averaging around 4-7 foggy days). The dry season of the year spans from November to May, with slightly cooler temperatures and less humid days; making it the much more desirable part of the year for visiting tourists as opposed to the stormy, humid wet season. Despite the dryness, winters are foggy and cloudy, averaging 10-17 overcast days and 11-17 foggy days per month during the dry season. Many tourists visit Veracruz during Christmas and March break, in the midst of the winter's comfortably warm dry season. Veracruz receives an average of 1,564 mm (61.6 in) of precipitation annually. The wettest month of the year is July with an average monthly total of 385 mm (15.2 in) of rainfall, while the driest month of the year is March with an only 13 mm (0.51 in) of rainfall. Temperature-wise, the hottest months of the year are June and August, both sharing mean temperatures of 28 °C (82.4 °F), while the coolest month of the year is January with a mean temperature of 21.2 °C (70.2 °F). ^ Although the values have a record of more than two decades, it can not be used as an overview of the local climate, as it does not reach the minimum period of 30 years required by WMO. ^ Stacy, Lee (1 October 2002). Mexico and the United States. Marshall Cavendish. p. 845. ISBN 9780761474029. Retrieved 20 April 2012. ^ a b c d e f g h i j k l m n o p q r s t u "Enciclopedia de los Municipios de México Veracruz Ignacio de la Llave" (in Spanish). Mexico: INAFED. Retrieved 29 October 2009. ^ a b c d e f g h i j k l m Alisau Graber, Patricia. "Un poco de gracia". MexConnect. Retrieved 29 October 2009. ^ a b c d e Rueda, Marisol (August 2005). "Overdrive: Mexico's Port of Veracruz expands to move more goods—cars above all else". Latin Trade. Retrieved 29 October 2009. ^ a b c d "Veracruz in la" [Veracruz in history] (in Spanish). Veracruz: H Ayuntamiento de Veracruz. Archived from the original on 19 June 2008. Retrieved 30 October 2009. ^ a b c d e "Vacaciones en Veracruz Puerto". Best Day México: Información para sus Viajes. Retrieved 29 October 2009. ^ a b c d Hursh Graber, Karen. "The Cuisine Of Veracruz: A Tasty Blend Of Cultures". MexConnect. Retrieved 29 October 2009. ^ a b c "Red Snapper Veracruzana". Epicurious. Retrieved 30 October 2009. ^ a b c d e "The History of Veracruz". The History Channel. Archived from the original on 8 February 2010. Retrieved 29 October 2009. ^ a b c d e f g h i j k Sanchez Diez, Jaime R (18 October 2000). "Estudio sobre reestructuración portuaria - Impacto Social Sinopsis Histurica del Puerto de Veracruz" [Study about the port’s restructuring- Social Impact Historic Sinopsis of the Port of Veracruz] (in Spanish). Mexico: Puerto de Veracruz Organización Internacional. Retrieved 29 October 2009. ^ "Historia de San Juan de Ulúa" [History of Fort San Juan de Ulúa] (in Spanish). Retrieved 29 October 2009. ^ Alberto Nájar (20 September 2010). "Sigue la devastación por el huracán Karl" [Devastation from Hurricane Karl continues]. BBC Mundo (in Spanish). Retrieved 20 September 2010. ^ a b "Veracruz City". Fodor’s. Retrieved 30 October 2009. ^ a b c d e f g h "Centro Histórico de la Ciudad y Puerto de Veracruz" [Historic Center of the City and the Port of Veracruz] (in Spanish). Archived from the original on 11 April 2009. Retrieved 29 October 2009. ^ "Consagrada Catedral de Veracruz" [Consecrated Cathedral of Veracruz] (in Spanish). ARQHYS. Retrieved 30 October 2009. ^ a b "Fin de semana en el puerto de Veracruz" [Weekend in the port of Veracruz] (in Spanish). Mexico Desconocido. Archived from the original on 16 April 2009. Retrieved 30 October 2009. ^ Todd Jr., John. "Chucho el Roto: The Legend of a Mexican Bandit The Folk Hero of San Juan de Ulua". Universidad Veracruzana. Retrieved 29 October 2009. ^ a b Castillo, Marko. "Chucho el Roto". Universidad Veracruzana. Archived from the original on 17 July 2011. Retrieved 29 October 2009. ^ "Baluarte de Santiago". Fodor's. Retrieved 30 October 2009. ^ a b "Acuario de Veracruz" [Veracruz Aquarium] (in Spanish). Archived from the original on 5 August 2009. Retrieved 29 October 2009. ^ "FUNDACIÓN DE LA ESCUELA NAVAL MILITAR" [Foundation of the Naval Academy] (in Spanish). Secretariat of the Navy (Mexico). Archived from the original on 1 September 2009. Retrieved 30 October 2009. ^ "Descripción e Historia del Edificio del Museo de la Ciudad "Coronel Manuel Gutierrez Zamora" [Description and History of the building of the City Museum "Coronel Manuel Gutierrez Zamora"] (in Spanish). Archived from the original on 17 April 2008. Retrieved 29 October 2009. ^ a b c d e Cortanos Delgado, Gabriela (31 October 2005). "La isla in disputa" [The island in dispute]. La Jornada Ecológica (in Spanish). Mexico City: UNAM. Retrieved 30 October 2009. ^ a b "Portal de Ciudadano Veracruz" [Veracruz Citizen Portal] (in Spanish). Archived from the original on 5 April 2009. Retrieved 29 October 2009. ^ a b Hughson Graber, Dean and Yoly. "Veracruz For Gringos". MexConnect. Retrieved 29 October 2009. ^ Carraher, Janice. "La Bamba Explained - Or, The Music Of Veracruz". MexConnect. Retrieved 29 October 2009. ^ "Carnaval de Veracruz Tradición". Retrieved 29 October 2009. ^ "Introducción Universidad Veracruzana" [Introduction Veracruzana University] (in Spanish). Retrieved 29 October 2009. ^ "Instituto Tecnologico de Veracruz-Historia" [Veracruz Institute of Technology-History] (in Spanish). Veracruz: Instituto Tecnologico de Veracruz. Retrieved 30 October 2009. ^ "UNIMEX® Universidad sin fronteras". www.unimexver.edu.mx. ^ Ludwig, Christopher (19 July 2016). "Volkswagen & Audi in Mexico part 3: Building in an extra level of efficiency". Automotive Logistics. Retrieved 13 May 2017. Volkswagen is set to lose a dedicated, covered parking garage for 4,000 vehicles that it has used for 30 years, which the port authority plans to redevelop for tourism. ^ Williams, Marcus (5 July 2017). "North American ports: Slowdown after growth tests capacity to cope". Automotive Logistics. Archived from the original on 3 August 2017. Retrieved 3 August 2017. Veracruz, which was the continent’s largest vehicle-handling port for the sixth time in seven years. ^ Kottek, M.; J. Grieser; C. Beck; B. Rudolf; F. Rubel (2006). "World Map of the Köppen-Geiger climate classification updated" (PDF). Meteorol. Z. 15 (3): 259–263. doi:10.1127/0941-2948/2006/0130. Retrieved January 12, 2013. ^ a b c d e f g "Veracruz Normales climatológicas 1981-2000" (PDF) (in Spanish). Conagua. Archived from the original (PDF) on 7 December 2014. Retrieved 12 January 2013. ^ a b c d e "Normales climatológicas para Veracruz, Veracruz (1951-1980)" (in Spanish). COLPOS. Archived from the original on 21 February 2013. Retrieved 12 January 2013. ^ a b "Veracruz (76692) - WMO Weather Station". NOAA. Retrieved April 25, 2015. ^ The Definition of the Standard WMO Climate Normal: The Key to Deriving Alternative Climate Normals, American Meteorological Society (June 2011). Retrieved February 8, 2019. ^ Redacción Cádiz. "México DF, otro hermano para Cádiz" (in Spanish). Diario Bahía de Cádiz. Cádiz ha sumado en los últimos años diversos hermanamientos en el continente Americano: con Veracruz (México); Montevideo (Uruguay); San Pedro de Cholula y Puebla (México); Cartagena de Indias (Colombia); La Dorada (Colombia); y con Bogotá, Guaduas, Honda, Mariquita y Ambalema, ciudades todas colombianas integrantes de la Ruta Mutis, en homenaje al bicentenario del fallecimiento del botánico gaditano. ^ "Tampa Sister Cities from City of Tampa website". Tampagov.net. Archived from the original on 18 October 2007. Retrieved 2011-04-17. ^ "Ciudades Hermanadas con València" [Valencia Twin/Sister Cities]. Ajuntament de València [City of Valencia] (in Spanish). Archived from the original on 2012-10-29. Retrieved 2013-08-08. ^ "Se hermanan las ciudades de Veracruz y Santos (Brasil)" (in Spanish). Archived from the original on 12 March 2014. Retrieved 12 March 2014. ^ "San Jose Sister City". 2014. Wikimedia Commons has media related to Veracruz City. Wikivoyage has a travel guide for Veracruz.